A child’s first six years is the molding stage where the foundation of knowledge is the basis and skills are inculcated. How a child become a unique individual is the result of a child’s own hereditary character and his or her immediate environment, interactions and experiences during those years. Telling about the direct environment, theorists and child behavior experts, regardless of their fields, agree that play is a vital part of a child’s developmental years. Young children get attracted towards bright colors, sizes, shapes, and sounds as well as games that support matching, ordering, and comparative analysis, as well as other forms of play that provide challenges to their mental faculties. Studies also show that early exposure to appropriate games and play develops a starting point for sound development. The playground, its play structures, kids playground equipment, and other play systems, provides a conducive learning environment. 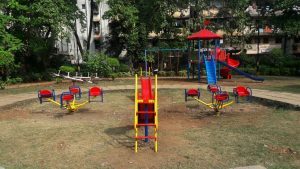 In general views, the playground is a spot where children assemble together with their parents and play with kids playground equipment like monkey bars, swings, and slides until they run out of energy. However, the experts say playground offers a setting wherein children develop their motor skills, cognitive performance, and socializing skills, which in later life might grow into ego mastery. A playground, fully equipped with the latest of kids playground equipment and other accessible playground equipment and play systems, is a vital spot for physical activity among children. As children heartily involve themselves in physical interaction and fun, they also hone and develop their motor skills and attributes, such as strength, agility, and endurance. The constant and progressive refinement of their skills boosts a child’s confidence and self-assurance, characteristics that are useful as a child matures further. All the practical analysis and theory conclude that there is a positive link between a child’s active play and the development of his/her cognitive abilities. A child who engages with other kids earnestly in a playground that has a variety of play systems has enhanced attention, planning skills, and memory as well as fast development in creativity, perspective-taking, and language. As social beings, the need to belong to a certain group is evident among children. Available playground equipment and tools act as a link where children converge and interact with one another. Such communications present children a chance to enhance their social skill naturally. Not only that, but kids playground equipment also helps a child in developing his or her emotional skills. Aside from being part of a group a child learns to value others and how to play in a team; deal with exclusion and dominance; controlling emotions, and evenly or otherwise share space and time with others. As per the discussion, the playground acts as a link for children to communicate and congregate. A clear picture of how a playground enhances social skills can be seen in group games of make-believe. A playground can become a fantastic place for kids with the help of playground equipment such as the Mega Tower can be changed into an instant castle where children portrait certain roles such as king, queen, and knights. Peer interaction should be established so the rules of the game can be appropriately set. It is interesting to note that most children do not have a link as to what rules are and how rules operate in a normal social function. But when these kids set their own rules, they all learn to adjust, discuss, and accept each other and work through their frustrations to make the game more significant. Other accessible playground equipment and play systems provide retreats, meeting places, and sanctuaries that offer opportunities for children to communicate and socialize with each other. The playground is not just a place where free play happens, though the name itself implies so. The playground that has accessible playground equipment and play systems designed for kids is, in fact, a learning ground where children learn important values and skills. This place is not made to make children happy by installing various equipment, but an essential spot where children discover what they can do, develop their abilities, and get ready for things coming their way in near future. Finally, this can be said that a playground helps to build a child’s unique character and attitude towards life.